The Sad Bear: Q: Are we not men? No, seriously, they really got these things trademarked. (The technical term is "energy dome.") And McDonald's apparently tried to pilfer the energy dome without asking Devo. I mean, look at the thing. 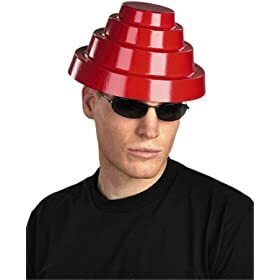 It's pretty apparently DEVO. And it's pretty atrocious. But that really begs the question: does DEVO really want to be remembered for that? I mean, in the span of things I guess they got a few things right, and sure, the energy dome made "Whip It" instantly recognizable, no matter who's preforming it But really? "Energy domes"? You're really gonna try and bust balls on this one? OK, I take that back, everything about DEVO is awesome. But I still don't get the potatoes. after a few links I, for some reason, let down my guard and started thinking they wouldn't keep on popping up as more YouTube videos. Mostly I just wanted to highlight certain moments from said videos. Except I don't exactly think I could have cut the videos into two second segments. So I just put them up there.